Late Night Waffles? Yes, please! Looking for a good late night place to swing by after being out in Boston? Planning to be in the Faneuil Hall area? Well I have the place for you! Saus is a good late night option on Union Street right around the corner from the usual standby's like Bell in Hand and Hennessey's - they describe themselves as "Boston's first Belgian street food cafe." They are open til 2am on Fridays and Saturday's, so even past last call. We walked all the way from the Loews by the common after a late movie and it was totally worth it! We opted for sweet over salty - but the basis of their menu is waffles and frites, with all kinds of homemade sauces. A basic waffle with powdered sugar is $3.75 and then you choose the sauces you want for an additional $0.75 each. Not a bargain, but a fun treat at the end of a night. We went with the homemade nutella sauce, which totally hit the spot. The waffle was still a little crispy, but soft and chewy on the inside - delicious. 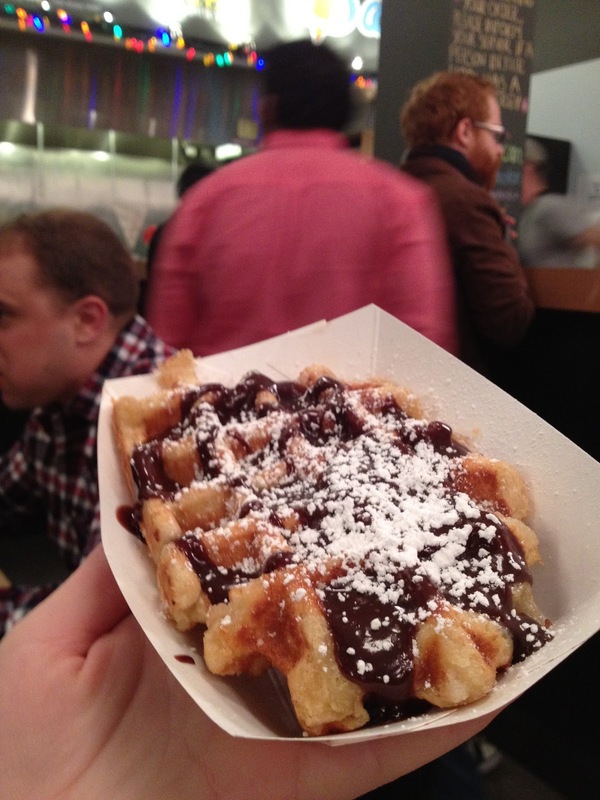 Other waffle toppings included 'berry berry,' 'salted caramel,' and 'lemon cream.' Next time I'll have to try out the frites, which start out a $4.25 for a 'petite' and go up to $7.00 for a 'big'. Plus they have 12 different homemade dipping sauces for the fries alone! Mm - bacon parmesan, truffle ketchup, green monster and even a little saturday night chive. The one downfall, for me at least, was the serious number of drunk people there given how late it was, but it is what it is - you're at a late night foodie spot near lots of bars, so if that's not your scene, you've gotten fair warning - just head over earlier in the night! Even though the place is a little small there are some hightops/bar areas to stand area, and some smaller tables with seats, so if you wait a little there'll probably be somewhere to sit to enjoy your belgian deliciousness. It's like Mr. Rogers went to Vermont with us! A couple weekends ago we had a long weekend away up at Killington and given a special someone's recent knee surgery we opted for non-skiing activities. As the title may suggest, we learned a lot that weekend. If you might remember watching Mr. Rogers at a very young age, our weekend was sort of like that - learning how to make various things. My favorite Mr. Rogers was when he did a behind the scenes look at how to make crayons! On this particular weekend we learned how to make beer, ice cream, goat cheese and dulce de leche at a cute little farm, and cider/cider donuts. 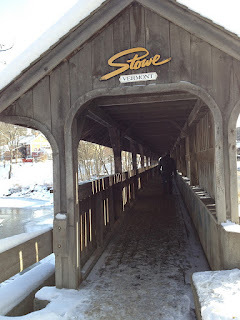 It was such a nice Vermont-y, local weekend! On the drive from Boston up to Killington, one of our first stops was at the Long Trail Brewery. In Bridgewater Corners, open daily from 10a-7p, they have a quick self-guided tour and on weekdays you can see them actually making beer. Since we visited on a weekend we didn't get to see anything in production, but it did explain the beer making process very well and they have a fun sampler from the bar that gives you 6 smaller samples of their beers so you can try more but still drive afterwards! Definitely worth a stop. Whenever I buy cauliflower I have so much I don't know what to do with it all - a head of it goes a long way, and this was my 3rd recipe using this one. I've made a cauliflower mac and cheese in the past that I really liked, so I sort of took ideas from that recipe and this one from Rachel Ray, and made up something a little different tonight for dinner! We've had our eye on this restaurant in Malden for at least a year now and finally found an opportunity to check it out the other week. It's right by the Malden Center T stop on the orange line - and parking is easy too. The Exchange Street Bistro is a lovely place, nicely decorated and tons of delicious sounding meals on the menu, which made making decisions very difficult! They were telling us about New Years eve there, and it sounds like they go all out - decorating with black and silver balloons covering the ceiling. You can even see the big '2012' numbers still hanging through the window below. I think this is definitely a special occasion option - prices are a little on the higher end, but the food was definitely worth it in our minds. After taking a bit of time to look through the menu, we decided on individual soups and salads to start rather than sharing an appetizer for the table. There was a cream of mushroom soup special that night, which both of my parents opted for. I, instead, went for something a little lighter - their Bistro Salad with wild-baby greens, dried cranberries, toasted almonds and pineapple dressing ($7), knowing that I was going for a richer, heavier main dish. The salad was a little basic, but I liked the different greens they used. The soup was far too creamy and rich for my taste, but it was a generous portion and my parents both loved it. It's hard to beat cooking in, drinking wine and catching up with friends on a Friday night after a really long week at work. Last week it was Lasagna night and thankfully, with a lovely group of girlfriends to catch up with! I know that lasagna has a stigma that it takes forever to make, but it doesn't have to. There are a lot of lasagna shortcuts - buying the lasagna noodles that don't have to be boiled first, buying sauce or using sauce you already have in the freezer, and having friends help you! Before leaving for work that Friday morning I took a couple containers of homemade tomato sauce out of the freezer to use, so I didn't have to bother to make a whole new batch of sauce. I sauteed up some ground chicken and added that and some diced mushrooms and chopped onion to the sauce, to give it a little more flavor and substance. In an attempt to be healthy by opting for whole wheat lasagna noodles, I couldn't find whole wheat ones that were also no-bake, so I did have to boil lots of water to cook the noodles before I was ready to start layering. Layers: Spoon some sauce on the bottom of the pan first, then layer with lasagna noodles, then spread some of the ricotta mixture on top, with sliced zucchini and then more tomato sauce; repeat again with more noodles, more ricotta mixture, more zucchini, sauce and noodles again. You can usually fit about 3 layers, but you want to make sure you end on top with sauce and the shredded cheese. Because everything is cooked already, the baking process is really more to heat everything up and melt the cheese. You should be able to bake at 350 degrees for 20-30 minutes, or until you notice the edges bubbling! I usually serve with mixed greens or a vegetable since the lasagna is pretty filling and heavy. Harvard Square - Endless Food Options! The one problem with working right in Harvard Square is that there is an endless number of restaurants, coffee shops and places for fun treats! Although I try my best to bring lunch to work usually, it hasn't stopped me over the last year from trying out a long list of lunch spots in the square. All fall and winter I am constantly incorporating pumpkin flavors into my dishes - I love it and it gives such a strong flavor to the recipes you use it in. With baking, it also adds a great moistness - and so it's an obvious addition to something like muffins or cakes or breads. My usual problem is that I open up a can of pumpkin puree (not pumpkin pie filling!) and only use some of it - and then have to find another recipe to use the rest in before it goes bad. This was what happened here - we were having a staff breakfast for the holidays at work and I knew I wanted to make muffins - and thankfully, I had about a 1/2 cup of pumpkin puree in my fridge that needed to be used - and viola! Pumpkin mini muffins!